Artists include: Jimmy Baker, Delphine Courtillot, Noah Davis, Jeremy Everett, Eberhard Havekost, Adam Janes, Titus Kaphar, Thomas Kiesewetter, Matt Leines, Becca Mann, Barry McGee, Faris McReynolds, Ellen De Meutter, Adam Pendleton, Peter Rogiers, Andrew Schoultz, Ed Templeton, Kehinde Wiley, and Ai Yamaguchi. 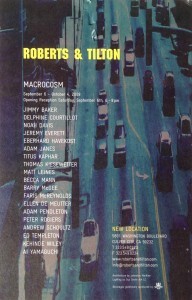 Roberts & Tilton is pleased to announce the inaugural exhibition, Macrocosm. This group exhibition, consisting of new monumental works by gallery artists, is in celebration of the opening of Roberts & Tilton’s new space in Culver City.